Mapping by county staff provided first responders and fire crews with up-to-date, accurate information. The cloud offers flexibility that meets emergency response needs. ArcGIS Online has become the county’s one-stop location for all GIS-related projects. For Kittitas County, Washington, better fire response isn’t a matter of more hose lines and fire trucks. It’s a matter of information. For every major incident, fire fighters need information, and so do command staff and the public. For everyone involved, providing continuously updated information to help battle the blaze and keep the public informed is paramount. On August 13, 2012, the season’s first major wildfire in Washington started between Interstate 90 and US Highway 97 in Kittitas County. Dubbed the Taylor Bridge Fire, it quickly burst out of control and spread, threatening homes and people. The fire was fully contained on August 28 after burning 23,500 acres and destroying more than 60 homes. As terrible as the destruction was, it could have been much worse. 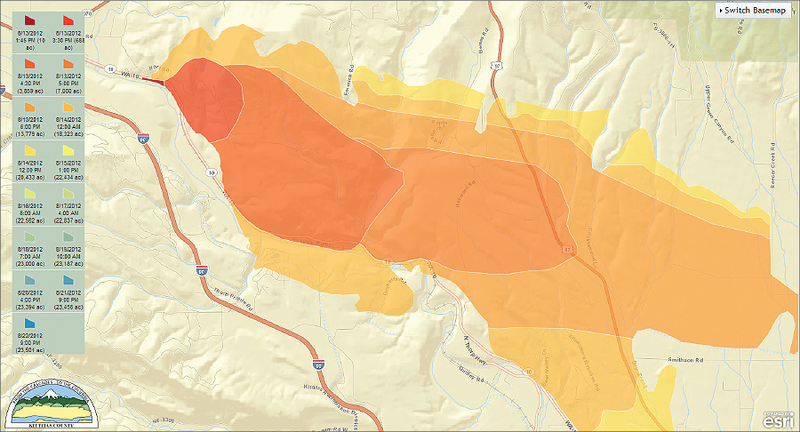 Fire fighters battling the inferno had a secret weapon on their side—cloud GIS. Using the ArcGIS Online platform, maps and data were quickly made available to field crews. Smart deployment of personnel and resources meant faster fire containment. Using accurate and high-resolution maps to support decisions, fire fighters were able to attack the right places at the right times to contain the fire and protect priority resources as quickly as possible. Brenda Larsen, fire marshal for Kittitas County, said the mapping by county staff was instrumental in providing timely and accurate information about the fire footprint to first responders and fire crews, helping them work safely. “Our GIS mapping staff at EOC was indispensable, and their work made it easier for everyone involved in the fires,” Larsen says. With a population of more than 40,000, Kittitas County is located in central Washington State. It spans the lush, forested Cascade Mountains to the upper Yakima River Valley plains and the Columbia River. Its county seat is Ellensburg, which is also the county’s largest city. The county has used GIS for more than a decade. In 2007, GIS was moved into the IT department. At the same time, Eklund was hired to streamline and improve GIS infrastructure to better serve government needs. GIS had been functioning at the county for about eight years previously. He immediately worked to consolidate independent software uses and upgrade software to an enterprise ArcGIS deployment. The county transitioned to a distributed editing environment within a year. Today, the infrastructure supports the City of Ellensburg, which partners with the county for resources and maintains a failover redundant server at the city. The latest GIS innovation involved moving to ArcGIS Online, a cloud-based GIS environment. The county acquired the software just prior to the Taylor Bridge Fire. The goal was to use it as a central mapping platform for the public. It would provide an open, scalable, and intuitive method for managing GIS data and services. When the fire occurred mid-August, the new system was ready. Web GIS served as the perfect platform to map the fire’s perimeter, determine the terrain, and identify assets at risk, all of which were immediately delivered through the cloud to first responders. 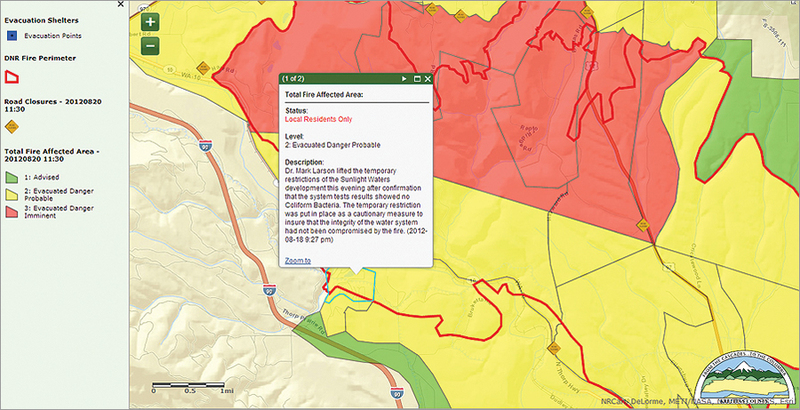 The map was published to ArcGIS Online for up-to-the-minute evacuation zone, roadblock, and fire perimeter status. Using GIS, Eklund published the feature service to ArcGIS Online, enabling command staff directing frontline personnel and resources to attack the fire to see what state, county, and federal assets were available and where they were located. Within 20 minutes, Eklund configured a web map and shared it as an application available to those who were supporting the operation. It also meant that important information about the fire location, road closures, and shelters was more readily available to the public. Because it was in the cloud, it could scale quickly to changing demand. “Having the service in the cloud took the pressure off our servers so we could continue to serve the public without downtime,” says Eklund. In addition, because it was in the cloud, any changes were quickly available to all users. The emergency command center oversaw the coordination of effort and used the online maps to track the progress of the event. The evacuation zones, roadblocks, closure boundaries, fire perimeter, and shelter locations were uploaded as a feature service and made available to fire fighters and the public. Prior to using web GIS, data updates and sharing would have been arduous, involving labor-intensive paper map production or e-mailing digital maps. GIS staff would also have had to use shapefiles that were compressed and sent as an e-mail attachment. The agencies would then have to decompress those files, add the shapefiles to their own GIS maps, symbolize accordingly, and print the new map. The only option for the public would have been to download a static map from the county website. With online GIS, the feature service containing all the fire mapping layers could now be consumed by other agencies in ArcGIS for Desktop or their own web mapping applications and be updated in real time. For instance, staff members viewed mapped evacuation center data in real time from their Internet-enabled computers to prepare evacuation strategies. When concerned citizens called the EOC hotline to ask if they were being evacuated, staff could easily look up their address and accurately respond to the question by viewing live and continuously updated evacuation-level information. In addition, online GIS mapping assisted with directing evacuees to the local shelters. Road closures were also mapped and managed via live mapping. The ArcGIS Online map was made available to the public via the county website and provided a search function in the map that was used by EOC call center staff and everyday citizens alike. They could type in an address to see if they were in or out of an evacuation zone, view road closures and fire perimeters, and more. The county website also added links to download the ArcGIS app for mobile devices or smartphones. “Fire mapping helped set up evacuations, send in supplies, identify vulnerable areas, set up staging areas, and more,” adds Carlson. “Combined with fire behavior knowledge, it allowed commanders to strategize based on factors such as topography, natural vegetation, and natural barriers and provided a basis for wildland fire fighting. It showed key factors that affect ground crews and fire behavior and provided commanders with up-to-date fire movement information. Eklund and Carlson agree that the cloud-based system is the scalable platform for future work. For more information, contact Jason Eklund, GIS coordinator, Kittitas County Information Technology. View the Kittitas County maps portal.